I’m pretty pissed at how the photo turned out for this recipe, because it’s so delicious and the photo kind of looks like crap. I feel so let down by my iPhone camera. Speaking of emotions, a few weeks back we got an all-staff email sent out at work with a notification that all meals served in the team dining room would now be 100% raw vegan, as part of a new heath initiative for the company. Needless to say I was beyond excited until I realized the date was 4/1 and this was HR’s idea of a hysterical April Fools joke! Ugh…joke’s on me…slanty face. So here’s what’s been going on- I’m obsessed with karaoke. I think about it all the time. When I’m not listening to Salt-N-Pepa “Push It” on repeat, I’m researching which Lonely Island songs are best for duets. It’s also always been my dream to be a professional backup singer. It’s the perfect gig- no pressure of being in the spotlight and you get to do fun dance moves! Whether you’re vegan, paleo or just trying to be a bit carb-conscious, spaghetti squash is one of those go-to dishes that sort of tricks your mind into thinking you’re eating comfort food. This recipe is a more savory take on spaghetti squash, which makes it a little more exciting than just using pasta sauce. The only bummer is it takes a while to prepare, but it’s worth it if you have the time! Pre-heat your oven to 375* F. Cut the spaghetti squash lengthwise, remove the seeds and place in a baking dish with the cut sides facing up. Coat with 1 tbsp of the coconut or olive oil, sprinkle with salt & pepper and bake for 45-60 min or until lightly browned and tender when pierced with a fork. 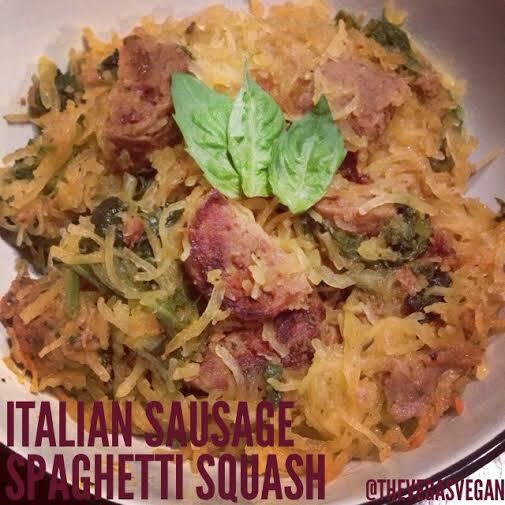 When the spaghetti squash is almost done baking, add the remaining tbsp of oil, the minced garlic and chopped sausage pieces to a large saucepan and cook on medium heat for 3 minutes, or until sausage is browned. Using a fork, pull the spaghetti squash strands out and add to the saucepan along with the spinach, basil and Herbs de Provence and mix well. Cover, reduce heat to low and cook for 20-30 minutes, stirring occasionally. Taste and add additional salt & pepper if desired. Serve hot!